As yet, people living near paper mills have not been at peace with their polluting neighbour. Not only are there conflicts, but clearly the local community in many cases has been able to assert its demand for the industry to clean up or close down. It would not be wrong to say that in this higher form of regulation, if anything, has pushed industry to improve its performance. The stick has never come from central or state pollution control boards. It has been local pressure; people have asserted their demands, mostly through the legislative system. Paper mills, because of their tremendous demand for water and wood, are invariably located in areas where money is scarce, but natural resources in terms of water and raw material are abundant. This disproportionate power system works for a while to keep the lid on things, but as the water intake in the paper mill continues, the river begins to dry up. Simultaneously, the pollution increases, for the river no longer possesses the ability to assimilate and dilute the waste; and tensions increase. The local community, the local pollution board, the local doctors, NGOs and others are important sources for information for GRP. Their knowledge and perception is an important gauge to judge the veracity of the data collected through company sources. A "green inspector" -- a volunteer with GRP -- visits each factory area to collect this feedback. What we learn shows, again, the way ahead. 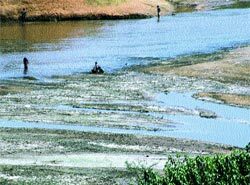 The problems are many: the point of discharge of the effluent is downstream of the point from where the mill sources water. This is an irritant to the local community. The high water requirement of paper mills means that local communities and the industry often compete for an increasingly scarce commodity. Parched Indian summers see heightened tensions, as rivers dry up and the water table drops. If conflicts over water weren't enough, the malodorous gases released during the chemical pulping process add to the grouse of local residents. The vast quantities of solid waste generated by paper mills tops it all. The industry is responsible for huge mounds of lime sludge that often characterise a town with a paper mill in the vicinity. The tensions between the mill and the local community are not eased by the fact that the pollution is very visible -- groundwater contamination, coloured river water, increasing water scarcity, the typical "rotten egg"-like smell from kraft mills and mounds of lime sludge. These issues, and more, are reflected in the GRP inspectors' report. But one state that stands out as a problem place is Karnataka. The local community indicted all three paper mills of the state: Harihar Polyfibres, located in Havari, was indicated for the pollution of river Tungabhadra; Mysore Paper Mill, located in Bhadravati, was indicted for water scarcity and water pollution in river Bhadrawati; and West Coast Paper Mills, located in Dandeli, was indicated for polluting river Kali. It is very clear that this reflects not just the problem of increasing water scarcity and an organised local population but the fact that the regulatory body, the Karnataka State Pollution Control Board is perceived to be weak and compromised. When GRP inspectors asked the local pollution control board to provide information about the paper mill, they provided a positive picture of the paper mills. 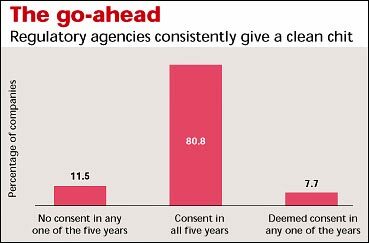 Their data showed that paper mills had been getting the consent to operate from the local boards (see graph: The go-ahead). This came as a stark contrast to the perception of the local community. The same companies which were meeting standards to the satisfaction of regulatory agencies were under protest from local people. Of the 28 mills rated, seven had one or more cases filed against them by the local community on pollution. But even here, there is a noticeable change between the two rating periods. GRP received must less criticism from local communities about the mills in the 2004 rating, as against the 1999 rating. This clearly reflects the improvements made by some mills to deal with their pollution problems and to improve their relationship with communities. For instance, there was strong dissatisfaction against the Orient Paper Mills in 1999, but as the mill stopped discharging the coloured effluent into the river Sone -- by diverting it for agriculture on its own land -- its relationship improved. The Mavoor unit of the Grasim Industries and South India Viscose (SIV), both rayon grade pulp mills, had to close down largely because of complaints from the local community regarding their coloured effluent disposal. In the case of the Mavoor unit, located on the banks of the Chaliyar river in Kozhikode district of Kerala, local protests against pollution forced the state government to form a high powered committee to recommend action, which suggested several steps. The state pollution control board gave the mill a year to comply and the mill management decided to close down. SIV discharged its effluents into the river Bhawani, and soon found itself in the midst of controversy. Public protests put pressure on the local pollution control board to step in. Legal action was initiated and the mill was forced to upgrade its pollution control equipment. It imported technology from Linde in Germany for effluent treatment. But the combined effect of high investments and protest proved too much and it finally closed down in October 2001. In the 1999 rating, the Orient Paper Mills at Amlai was in big trouble. Local people were angry; the discharge of wastewater from the mill into the Sone river was killing fish and affecting cattle. Villagers living downstream were protesting against the untreated effluent discharge. Cases were filed in court and people protested outside the factory as well. The main problem was with the bleach plant effluent generated by the mill, which was almost black in colour and had a foul odour. The mill hired National Environmental Engineering Research Institute to plan and implement disposal of the coloured bleach-plant effluent on land. This system was implemented and the bleach plant effluent is used for crop cultivation. The pollution load of the mill has come down substantially. While problems still remain, because the Sone is an extremely stressed river in a water scarce region, the positive efforts of the factory were reflected in community perceptions during the second phase of the rating. Bad smell is the hallmark of a kraft pulping process -- malodorous gases, including hydrogen sulphide, and mercaptans -- assault the senses. People living near the mill resent its odour and in the case of the Andhra Pradesh Paper Mills they made sure that the smell disappeared. The inmates of the Rajamundry Central Jail are the mill's neighbours. They found the bad smell, which the mill released four or five times a day, unbearable. They filed a case against the mill for odour. The Andhra Pradesh high court returned a verdict in favour of the prisoners and directed the mill to control odour. The mill complied and an odour incineration system was commissioned in October 2002. This is the only mill in the country with such a system. It is clear that the regulatory standards are failing people. It is also clear that unless regulation is designed to take into account the characteristics of a specific case, it will be impossible to ensure that there is no adverse impact on the environment and on the people who live in the vicinity of mills. Therefore, regulation may be designed for monitoring the total pollution load of the mill, but as it does not take into account the specific carrying capacity of the environment, into which the waste is being discharged, the waste can still be a problem. And it is. Take the issue of water discharge by these plants. The wastewater regulations are designed for discharge into river or waterbodies. But they are designed for a river or waterbody which has adequate assimilative capacity; in other words, can dilute the wastewater. But with rivers getting more stressed, these regulations do not work. The inevitable result is pollution, which affects people. Then, too, regulations are not designed to take into account what affects people. There is no regulation for colour, no regulation for odour. Given this situation, people living around the mill are a possible barometer to judge its performance. Their view can be coloured by local petty politics, their view can also be biased in favour of the mill because of its clout. But on the whole, they provide the push for industries to improve. They are the trigger for change.